With the Apostles' Fast at hand, Fr. Thomas reflects on the practice and rules for fasting. On August 15, the Church celebrates the Dormition of the Mother of God. Fr.Tom explores the theology associated with this Feast and the implications on our own resurrection. What is this current fasting period all about? We reach back into the archives and re-introduce this helpful teaching from Fr. Tom originally given last year. Fr. Tom couldn't let the Church Year end without looking back on the inspiring feasts during its last month, August. In part 2 of Fr. 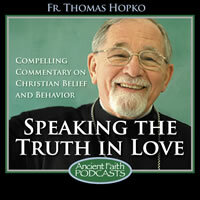 Tom's reflection on the Pre-Santified Liturgy, he talks about a mis-guided practice from the previous centuries of denying the gifts to children or the mentally impaired. Everyone who knows about the Orthodox Church, even in the slightest way, knows the Orthodox Church and in general the ancient Christian Church was a Church that attributed a great value and significance to fasting. Actually, as the Christian faith developed, there are very, very many fasting days. In the Orthodox Church, virtually every Wednesday and Friday of the Church year is a fasting day, and then there are special days which are strict fasting days, like, for example, the day of the Exaltation of the Holy Cross in September or the Beheading of John the Baptist is a fasting day on the 29th of August. So there are days that are particular days of fasting, and during the Church year, there are four fasting periods that have grown up and developed within Orthodox Christianity. Everybody knows about the Great Fast, which takes place before holy Pascha. You have the 40-day fast that actually is eased into by a few weeks of preparation, even when the fast… You kind of ease into fasting, and then you have the 40-day fast, and then the fast continues right through Lazarus Saturday, Palm Sunday, and all of Holy Week so that the fast before Pascha is more like 50 days than 40. Then there is a 40-day fast before Christmas. Beginning on November 15 up until December 25, it’s a fasting period. And then, in the summertime, before the summer Pascha—it’s called sometimes the summer Pascha—the festival of the death and glorification of Christ’s mother, Mary. There is a two-week fast, a 15-day fast from August first to the fifteenth. And now, just right now in this time of year, the Church also had a fasting period from the day after the Sunday of All Saints, which is the Sunday after Pentecost, until the feast of Ss. Peter and Paul. Of course, that fasting period could vary in length depending on when holy Pascha was celebrated. So this year, for example, the feast of All Saints, the Sunday after Pentecost, would be June 22, then the 23rd would be the fast, and already the following Sunday on the revised calendar, the new calendar, would be the feast of Ss. Peter and Paul. So if you’re on the new calendar, the fasting period would just be those five days. If you’re on the old calendar, then you’d have an extra 13 days; [using] the old calendar, it would be the twelfth of July. About fasting: first of all, we all know—we should know—that the Lord Jesus Christ fasted and taught people to fast; that he fasted after his baptism; he was driven into the desert and fasted for 40 days and 40 nights. And then we know that sometimes he went away and fasted. We know from the Book of Acts that the apostles fasted. We know that the Apostle Paul in [the] letter to the Romans, the Corinthian letters, he speaks about fasting, about eating, not-eating. Probably the most prominent teaching about fasting, the central teaching about fasting, would be in the Christian Torah: the Sermon on the Mount, which is the Christian law, the interpretation of God’s law for Christians, that begins with the ten Beatitudes, which are like the ten words of the Ten Commandments, and then you have an interpretation of the Mosaic laws as understood and interpreted and fulfilled and commented on by the Lord Jesus Christ himself. So in the Sermon on the Mount, you have the Lord Jesus saying, “When you fast.” He doesn’t say, “If you fast,” [but] “When you fast.” Then he tells what you do. Just like he says, “When you pray,” and then he tells what a Christian ought to do and what a Christian ought to say. He also says, “When you”... In English we say, “When you give alms.” Actually in Greek it would be, “And when you do acts of mercy, when you actually do charitable acts of helping and serving others,” this is how you do it. And in every case he says you must do it; it’s simply part of the discipline of being a human being and being a Christian. Then he says that you do it in secret, you do it for the glory of God, you don’t do it for the praise of men, you don’t do it as an end in itself; it’s a means to an end—but it’s a very important means. It’s a means by which we open ourselves to the grace of God. It is an expression of our faith in God. “We are saved by faith through grace, not by works, lest any man should boast.” So we’re not boasting in the works of fasting, but believing in Christ, obeying him, acting in his name, imitating his example, and opening ourselves to the grace of God that’s given to us through him, then fasting—abstinence from food, change of diet, limiting the kinds of food and drink that we consume—that is part of the Christian life, and it’s an essential part. Of course, Jesus says, it’s not what goes into a person that defiles, but what comes out. The kingdom of God is not meat and drink, as the Apostle Paul says, but peace and joy in the Holy Spirit. So we don’t boast in our fasting. As the Church songs say, it’s silly to boast in fasting, because the demons never eat, and they’re the most evil beings that you can think of. But it is the teaching that, without fasting, we cannot really live a spiritual life, without that self-discipline, abstinence, controlling, not worshipping our belly, not simply giving ourselves over to satiety and food, not filling ourselves with the kinds of food that stir up the passions and so on. That’s just a normal thing, and virtually every ascetical tradition on the planet earth knows that, whether people are fasting because of some spiritualistic view of reality or whether they’re fasting because they’re athletes or dancers or artists. Football players and basketball players, they have to watch what they eat; they have to be careful about their food. That is simply part of human life. And by the way, I just might mention, there’s a very good book… For the sake of full disclosure, I have to say it was written by one of our daughters, Catherine Mandel, but there’s a good book [published] by St. Vladimir’s Seminary Press called When You Fast: Recipes for Lenten Days and Lenten Seasons. But in that book, which has recipes with and without oil and dairy and so on, there are a lot of quotations [which] were printed in this book from the Bible and from the saints and from the sayings of the Desert Fathers about food, about how Christians relate to food, how they relate to eating and drinking, how they relate to fasting and abstinence. Bascially, they all say the same thing. They say: you must do it. Probably one of the most colorful expressions about this is from Theophan the Recluse, a Russian saint who said, “The whole spiritual life begins with the stomach,” and in that he was being very traditional. In fact, St. Anthony the Great, the kind of quintessential, prototypical monastic teacher, he said that if you really want to be saved, what you must do beside always having God before your eyes, always acting according to the Scripture and never jumping around from place to place; he said what you also have to do is: don’t trust in yourself and your own righteousness; don’t worry about the past—the past is over—and then you guard your mouth and your stomach. By mouth, he meant not only eating, but what you say, because you have to fast from words, but also your stomach. So St. Theophan the Recluse, he said, if our stomach is out of order, if we have the wrong kinds of foods or too much foods in us, then for sure, he said, you will have… If you have a full stomach, he said, you will have a hard heart, a stiff neck; you’ll have a babbling mouth, you’ll have itching ears, you’ll have wandering eyes, and you’ll have revolving and whirling thoughts, and the thoughts are the cause of all of our difficulty. In fact, Maximus the Confessor said everything in life, in the spiritual life, all the difficulties, he said, are cause by four things. One is demons; demons are always attacking us, especially when we try to do good. Scripture says… The Apostle Paul, for example, he said: I find it to be a law that when I want to do good, the devil is close at hand. Or in Peter, it says the devil goes about like a roaring lion, seeking whom to devour. Or in the gospels it says that the devil’s even going to appear like an angel of light to ensnare, if possible, and destroy even the chosen, the elect. So the demons are always there, he said, but there are three other things that cause us all our grief: memories, things that have happened to us, our experiences, our childhood—that’s constantly there, causing us all kinds of troubles. Then the other two things, he said, were the weather and food. He said when the weather goes up and down and it’s hot and it’s cold and it’s humid and it’s awful, that can really affect our spiritual state. And then he said food, though: too much food, the wrong kind of food, food that doesn’t agree with you. How many of us have foods that we know, if we eat them, we’re not going to feel well? We’re going to be sick, and we go ahead and eat them anyway, and indeed we feel sick. Then we get grumpy and cranky and weak and sleepy and all those kind of things. So food is critical, and the best way of dealing with it is by a disciplined rule of fasting: certain days of the week, certain times of the year that we just abstain. We just don’t eat certain things, and we do it as a rule, and we change our diet, as a rule, to kill self-will. Abandonment of self-will is one of the main disciplines for doing the will of God, because the clash is: either God’s will or my will. One of the places that we are the most willful is in our eating and drinking, so it’s a very great training. It’s an ascesis just to train ourselves to be in control of our eating and drinking. Then, of course, offering our strength and even the money that we save, that we wouldn’t pay for certain kinds of foods, giving it away and doing the will of God. Our Lord Jesus Christ did this, and if anyone thinks they [shouldn’t] do it, it means [they think] they’re better than Christ; they think themselves better than Christ. In the Church, which is a community of faith, because people live in communities, that’s why it’s necessary to have communal fasts from time to time, so that everybody would be in it together. A family would be in it together. It wouldn’t be just an individual matter. Nevertheless, even though there can be community discipline, like, for example, for an Eastern Orthodox Christian, we will fast from June 23 this year to June 29. If we’re on the old calendar, we’ll have 13 more days to fast. We’ll just do it by discipline, together with others within our community, but we still won’t do it to be seen by men. We still won’t do it to blow trumpets, so everybody says, “Oh, look how they’re fasting.” We still won’t do it because we think fasting in itself is some kind of meritorious thing, because it’s not. It’s a means; it’s not the end. But we will do it together, and it makes it easier when you’re doing it together. If you live in a community then you know what to put on the table. You usually, as St. Benedict said, you set the table for the weakest brother, and then those who want to fast more severely can do so, not showing off, doing it kind of in a hidden manner, discreetly, and limiting themselves by their own will. So it is absolutely necessary. When we think of the communal fast, there’s something else that we might just want to point out. A lot of times we think—and I know that Orthodox Christians think—that fasting, especially the four fasts of the year—the Great Fast before holy Pascha, the fast before the Christmas-Epiphany season, the fast before the Dormition of the Theotokos, and the fast before [the feast of Ss.] Peter and Paul—are primarily exactly fasts before. People think of them as fasts before, kind of preparatory fasts, like: we’re going to celebrate Pascha, so we prepare by fasting; we’re going to celebrate the Nativity of Christ and his Epiphany into the world, so we prepare by fasting; we’re going to have holy Communion, so we prepare by fasting, because, normally we fast before we receive holy Communion. It doesn’t mean necessarily that we have fasting days, like a Saturday before a Sunday, but the Wednesdays and the Fridays are part of that discipline for the rhythm of receiving holy Communion on the Lord’s day. So we’re going to celebrate the summer Pascha, celebrating our resurrection with Christ in the person of his mother, Mary, so we prepare for that season by fasting. However, I think that it would be accurate to say that fasting, especially the Church fasts, they’re not just fastings before. They’re not just fasting in preparation. I think that the fasting is often also a fasting after, a fasting after a particularly festal or particularly celebrating season. In the Egyptian Church and in the Armenian Church, there was the practice after a big festival, you would declare a fast. Some people even think that the Great Fast, especially as it emerged in the earliest Christianity and particularly in northern Africa and the Church of Alexandria, was as much a fast after the Nativity-Epiphany season as it was a fast before Pascha. Of course, it was very convenient that the time after the Christmas-Epiphany season was exactly the time before Pascha, so it was like, so to speak, tailor-made to be a fasting season. In fact, very often in the Church year, the fasting season for the Great Lent or the pre-lenten season begins almost immediately after the leavetaking of the Christmas-[Epiphany] season. This year, in 2008, it was that way. We ended and had the feast of the 40 days after Christmas, the Meeting of the Lord in the Temple, and then immediately it was the [Sunday of the] Publican and the Pharisee and moving into the fasting season. But some people think that the Great Lent was not just before Pascha and connected with preparation of catechumens, but it was a fast declared after having these big celebration days of Christmas and Epiphany, where you really didn’t fast; you feasted. You had feast days, and you really ate, you really drank, you really celebrated. Then, when that was over and you took leave of it, then you had a fasting period, kind of to bring yourself back, to put yourself back in order, to take control of your life again. I really also believe that this is probably more the origin of the Peter and Paul fast that follows Pentecost and the Sunday of All Saints. It’s as much after Pentecost as it is before Peter and Paul. In fact, I have a hunch—I may be wrong on this; of course, I may be wrong on everything I say; you have to decide—but it seems to me that to have a preparatory fast for Peter and Paul all of a sudden doesn’t seem too convincing. Why would that be? But to have a fast after the 50 days of Pascha, and even more, because the week after Pentecost is a no-fasting week at all: not Wednesday and not Friday are fasting days of the Pentecost week. So actually, the end of the Paschal celebration season is actually the Sunday after Pentecost, which is the Sunday of all the saints. Then the fast begins on the next day. I think it’s kind of a fast after. You have 57 days of festival time, feasting. Of course, most Wednesdays and Fridays during the Paschal-Pentecostal season are still fasting days, although there are certain Oriental traditions that don’t have fasting days during that whole 50-day period, including the five days after Pentecost. Some traditions have the big fast before Pascha and no fasting until after the Sunday of All Saints after Pentecost. But the normative practice, certainly the monastic practice, is that after Bright Week, after the Pascha week, then the Wednesdays and Fridays during the Pentecostal days, the 50 days, are fasting days, but the week after Pentecost is not. So I do think, honestly, that the Peter and Paul fast was more a fast following the great season of Pascha, where I have many friends who say, “All the weight that I lost by fasting during Great Lent I put back on during the 50 days of the Pascha-Pentecost season.” If I weighed myself on the Sunday after Pascha and see I lost 10 pounds, usually if I weigh myself again on Pentecost, I see that most of that is back, if not all. That’s how we live; we go up and down, but we have to have discipline. We have to have some narrow path where we’re not going up and down in a grave manner. It seems that this fasting season after All Saints’ Sunday is actually a fast after the Paschal-Pentecostal season, and then the rule simply is: Well, you fast until you have Peter and Paul. When the festival of Peter and Paul comes, you celebrate it and then you go back to your normal eating and drinking habits until you get to the first of August and you prepare for Dormition. Even the fast before Dormition, certainly it’s a preparation for that great festival in the summer, of the death and glorification of the Virgin Mary, Christ’s mother, but probably also it is a time where summer, being a real time of picnics and eating and drinking and vacations and holidays, it could very well be that the holy Church also said, “Okay, summer’s going to be over now. We’re going to get back to our normal life again.” The revised calendar, the 15th of August is the Dormition; it’s 13 days later on the old calendar. It’s kind of a fast to end the summer, to end the picnicking, holidaying, vacationing summer and to get oneself back in shape to enter into the work life, the school life that begins again at the end of August and the beginning of September, to move into the fall, and then again, by the time you get to November 15, another fasting season will come. It’s really very nice in the British sense of that term, very nicely crafted, clearly crafted, how you have these seasons of fasting and feasting through the Church year, eating and drinking and then cutting back, in order to maintain a good, clear, self-controlled disciplined life as given to us by God. Human beings are creatures of habit and variation, and we are also, alas, creatures of excess, creatures of being immoderate, of being incontinent, of overdoing it, of letting ourselves go, of not being disciplined. It helps when you want to live a disciplined life when you do it with other people. I think most Orthodox Christians know that if it were up to themselves individually, they would have a harder time keeping the fast than when they’re doing it with other members of their family or the other members of their monastery or of their school, and you do it together and you bear each other’s burdens and you don’t lead each other into temptation, but you still do it secretly. You still hide yourself; you don’t flaunt it. But it’s wonderful to have, in the Ecclesia of Christ, the Church of Christ, as in the Bible itself, as in the Old Testament: there were the seasons of the fasting, declaring a fast, the fast of the first day, the fast of the seventh day. We find this in Joel, in Zechariah, in the Torah. There were the fasting days, and, as we already noted, the Messiah, the Lord Jesus Christ himself, fasted, and taught us to fast. The apostles and the saints all fasted, so fasting and abstinence is part of our Christian life, so Orthodox Christians have a little fasting period following Pentecost that begins on the day after the Sunday of all the saints, which is the Sunday after Pentecost.